This is the first game in the Contra series. For other games in the series see the Contra category. For the NES conversion of this game, see Contra (NES). For the Game Boy game called Contra in Japan, see Operation C.
Contra (魂斗羅, Kontora? 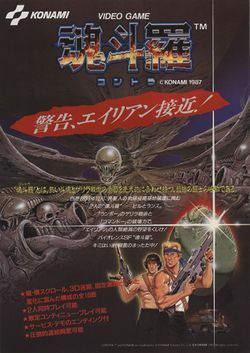 ), known as Gryzor in Europe and Oceania, is a run and gun action game developed and published by Konami, originally released in the arcades on February 20, 1987. In Japanese, the title is spelled with the kanji characters 魂斗羅 or Kontora. This is a form of ateji, in which the characters are used for their phonetic pronunciations rather than any inherent meaning they may have. The main character is equipped with a rifle with an unlimited amount of ammunition. The player can also jump, move and fire in eight directions, as well as move or jump simultaneously while firing. A single hit from any enemy, bullet, or other hazard will instantly kill the player character and discard the current weapon. There are a total of over 10 areas in the game. There are two types of stages in Contra. In addition to the standard side view stages, Contra also features stages in which the player character is seen from behind and must move towards the background in order to proceed. Each of these "3D maze" stages are set inside the corridor of an enemy base in which the player must fight through the base's defenses in order to reach the core of the base. During the 3D maze stages, the upper screen will display a map of the base along with a time limit. Each maze stage is followed by a "3D fixed" stage set at the core of the base, in which the player must destroy a series of flashing sensors to expose an even larger sensor and destroy it. Contra also features a two-player cooperative mode. Both players occupy the same screen and must coordinate their actions. One player lagging behind can cause problems for his partner, as the screen will not scroll onward, and a slow player can be fatal to his partner. The European release, Gryzor, does not feature a simultaneous 2-Players mode. Instead, both players take turns: whenever one player dies, the other gets his turn. There are a total of four weapons the player can retrieve from flying weapon capsules, pill-box sensors, or red guards during 3D mazes. All the power-ups in the arcade version are represented by Eagle-shaped letter icons with the exception of the Machine Gun and Laser. In the arcade version, the flying weapon capsules only appear if the player is not wielding any special weapons. Contra was ported as Gryzor to the Sinclair ZX Spectrum, Amstrad CPC and Commodore 64 by Ocean Software for their release in Europe in 1988, with the Commodore 64 version also being released as Contra in North America by Konami. On November 8, 2006 an Xbox Live Arcade port was released. This was the arcade version and included both original and arranged modes of play, as well as achievements. September 12th 2631, Midnight. The latest and most powerful automatic was equipped, and the radar commanded by the Marines caught a small-size meteorite that was approaching abnormally to the earth. The meteorite fell 20km north-east of New Zealand at the gal mosquito archipelago. The command did a long-term observation of the meteorite after that. Two years later, on December 2633, an intruder known as Red Falcon was occupying the Gal Mosquito Archipelago and was planning the fall of mankind. Command ordered a confidetial investigation at the enemy's front base. The marine post ordered two "Contra" Soldiers Private First Class Bill Rizer and Private First Class Lance Bean. Their mission is to penetrate the insides of the enemy, destroy the front base and the entire center of operation. Bill and Lance are sent to the Gal Mosquito Archipelago. This page was last edited on 28 June 2012, at 09:54.